I graduated today. Nothing unusual in that. Except I’m 46. And I first registered for my PhD over 14 years ago. It was a fantastic day. Made even more special by the time spent waiting for it to happen. Our honorary graduate, Dr Maggie Aderin-Pocock gave an inspiring and enthusiastic address about how if you really apply yourself to something with all of your heart it will happen. And no doubt, she’s right. However, it led me to reflect how some of us don’t have the gift of being single-minded about their life’s ambition. In fact, some of us don’t even really have a single life’s ambition. It seems to me that those that do are the lucky ones. There is never any question as to what they will do, and with a whole life dedicated to achieving it, the odds of doing so are considerably increased. I never had a clear idea as to what I wanted to do. I could apply myself to most things, so no clues there. I did a degree in English Literature, not something practical and vocational, so again, no clues there. Like many people, I kind of fell into my career (in libraries and action research). Luckily, I loved it. 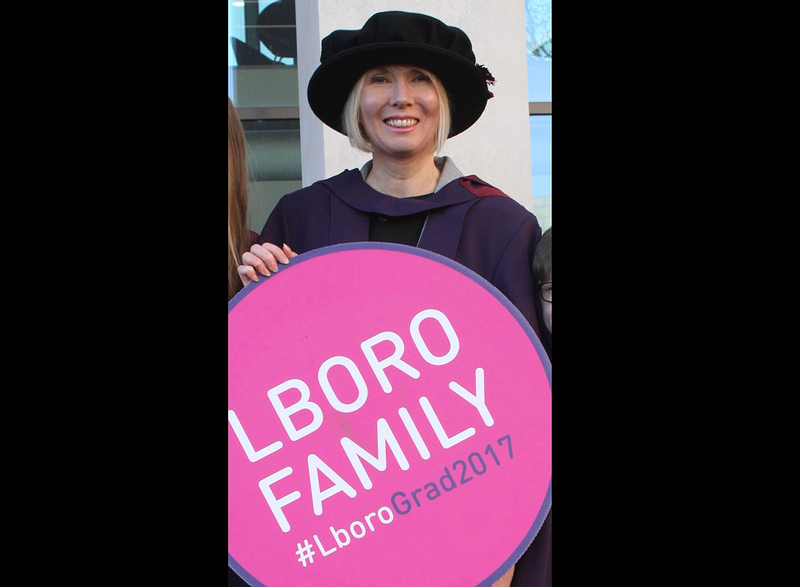 And after a number of research projects resulting in a series of publications, I first registered for a PhD by publication at Loughborough. But after having my first baby, and realising that actually writing a PhD was not something that sat easily with looking after the most important person on the planet, I withdrew. It was a sad day. But that baby (now 14) became my priority; and after 4 years, her brother too. I still worked part-time; still loved it. I ran two choirs. Three years ago, I picked up the PhD again, beavered away at it in my non-working days whilst the kids were at school, and the rest is history. I guess what I’m saying is that a single-minded focus on your life’s ambition (if you have one) is not something that most of us experience. Our goals fluctuate, our ambitions change, we enjoy many things (hobbies, families, jobs, study), not one, and their importance ebbs and flows throughout our life. Achieving your goals takes longer when there are more of them (14 years in this case) but you do get there in the end. Life is long. Things are complicated. For many of us, our true purpose might not become apparent until much later on (if at all). We just carry on opportunistically taking advantage of any interesting offer that comes our way. It doesn’t make our lives any the less valid. In fact, my colleague (also in her forties) who graduated on the same day as me, agrees that the experience we clocked up prior to submitting our theses made them an even more significant contribution to our fields. So if you’re thinking of doing a PhD and you have other stuff in your life, my message is that you can have (bits of) it all. You can do it. It might take a bit longer, but you can do it. If you’re thinking of doing a PhD and you’re older than your average PhD student, then good. Your thesis will be the richer for it, I guarantee. Don’t disqualify yourself. If you fancy doing a PhD, but not now. That’s good too. It will wait for you. And when you come to climb up those stairs to greet your smiling Chancellor, and a sea of well-wishing academic staff, family and friends, it will be one of the best days of your life.